any members play bf3 still? like ANY? played it about 2-3 weeks ago... missed that mp5k in canals... I forgot how load outs work in BF3. Anyone actually play #5 still? I try to get in there when I can... but I seem to be populating #6 most of the time. @[member='sirthesir'] Welcome to the ADK community. What games are you playing? Games you want to get into? @[member='Bboy'] Just say hi... and hang out til you get comfortable. @[member='Bboy'] - Welcome to the ADK community. Hope you have fun and make great friends while you are here. Like Laith said, join us in Teamspeak and have a look around. Sup @[member='Ballin Big Hoss']! Welcome to ADK. Have fun, make friends, go out and spread the ADK life to the world. There are a lot of free games to play, like World of Warships. And some games on steam for less than $10. Besides not all the AAA titles are worth $60.. take for example, BF:hardline or Titanfall.... LOL Just have fun playing, its just a EF'n game. Hello Monty! Welcome to ADK. Have fun, make friends, go out and spread the ADK life to the world. You could even become an ADK advisor/admin someday if you wanted to. Hello @[member='tyler king']! Welcome to ADK. Have fun, make friends, go out and spread the ADK life to the world. What is so great about joining a community such as ADK is that you can get into a game just by lurkering in a teamspeak channel to see if it's to your liking. I probably would have never gotten any of the other games out if I didn't just follow some friends over to another TS channel. I started in ADK being killed in BF3, who knew that minecraft was gonna be so addicting. Hello @[member='Guardian9214']! Welcome to ADK. Have fun, make friends, go out and spread the ADK life to the world. 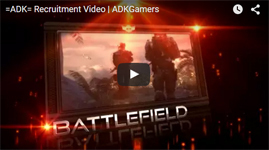 You could even become a BF3/BF4 advisor/admin someday if you wanted to.